Mark and Alayne Johnson of Columbia City operate Shady Grove Farms, south of Churubusco, along with other family members. A Jan. 24 editorial citing information from the Hoosier Environmental Council is false and misleading – and it is all in an effort to push Indiana's lawmakers to take local control away from Indiana's 92 counties and to limit the ability of our Hoosier livestock farmers. Government officials at the county level regulate where and whether livestock barns are built. There are eight Indiana counties that have no confined feeding operations or concentrated animal feeding operations. Several other local governments have implemented such stringent local ordinances that they essentially stopped the construction of additional CFOs and CAFOs in their counties. Why should control be taken away from local governments, which know how agriculture fits into their county's strategic plan and zoning regulations, and given to a state agency with no local knowledge? Hoosier livestock farmers adhere to strict local, state and federal regulations that protect the health and safety of humans and animals in addition to protecting the environment. Farmers in Indiana are subject to inspection at any time, and operating permits must be renewed every five years. The state also regulates manure storage and handling, manure application rates, setbacks from waterways and more. By regulation, CFOs in Indiana are not allowed to have any manure discharge. The only time manure leaves a barn is when it is applied at agronomic rates to cropland as a fertilizer. Animals at Indiana's CAFOs and CFOs only produce enough manure to fertilize 3.6 percent of the cropland in Indiana. The majority of cropland in Indiana that doesn't get manure as fertilizer instead has to rely on commercial fertilizer that is often from out of state. Since manure is a natural, nutrient-rich fertilizer, we need more manure in Indiana – not less. Today's livestock barns are high-tech structures that are capable of holding more manure. For instance, modern hog barns have up to 300 days of storage versus the 60- or 90-day storage of past generations of barns. Hoosier farmers in many cases spread manure once or twice a year instead of every few months. This is a significant advancement, since more storage means that farmers are applying manure less frequently and saving land application for times when conditions are optimal. This equates to fewer days of smell for farmers, their families and rural residents. Manure is a byproduct of agriculture, and it does smell. This is one of the reasons agriculture is practiced in rural areas. To be clear, Indiana's laws do not regulate odor; they protect the environment. However, local county governments have the ability to determine how close barns can be to other land users (such as rural homeowners). It is important that Hoosiers are provided the facts as state lawmakers consider new laws for an already heavily regulated industry. Indiana's farmers are responsible stewards of our environment. 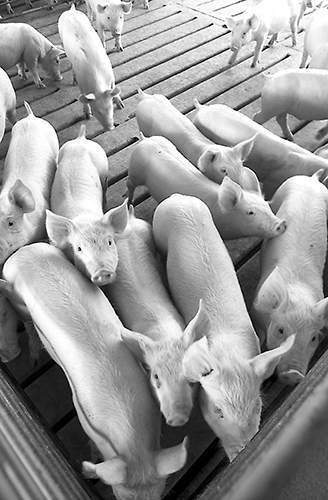 According to the new study, “A Retrospective Assessment of U.S. Pork Production: 1960 to 2015,” the inputs needed to produce a pound of pork in the United States have become more environmentally friendly over time. Specifically, 75.9 percent less land was needed, 25.1 percent less water and 7 percent less energy. This also resulted in a 7.7 percent smaller carbon footprint. Hoosier farmers are family farmers who intend to keep their farms in the family – thus it is in their best interest to protect Indiana's land, water and air from harm for the next generation.